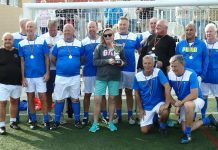 Quesada Bowls Club has posted another great success in winning the Costa Blanca Premier 20 Knockout Competition. Opponents in the final were The Emerald Isle. 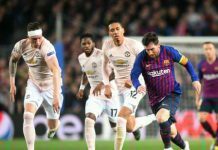 !0 players at home and 10 players away. 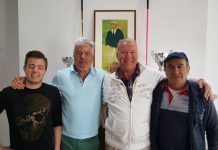 The result of the Final was that Quesada won the Singles, Pairs and Fours at home, and the Pairs, Triples and Fours away giving an overall win to Quesada of 12-4. The photograph shows the winning squad with the Premier 20 trophy. Winter League. This week the squad were at the Emerald Isle to face another very strong side, this was a very closely fought match played in good spirit. Vistabella did win on three rinks and the overall shots..a very good mornings bowling. L Watkins, T French, A Brown & M Furness 23-18. J Chaplin, M Foulcer, B Norris & E Bishop 20-15. B Regan, C Watkins, C Thorpe & B Pain 15-14. Shots, VB 81(8) – 77(4) EI. Well done to the Berleen team of S Kirk, O Ratcliffe, S & D Jenkins winning 15-13. VCL Div A. First game saw the Vikings v Saxons for a competitive home derby, each team won three disciplines with the Vikings winning the shots, Lin Watkins (S) won Ladies Singles 17-21. Ian Kenyon (S) Won the Men’s Singles 21-10. F Barclay & M Furness (V) won the Pairs 23-12. T French, C Watkins & M Regan (S) won the Triples 17-11. Vikings won both the Rinks, L Bishop, E Blythe, D Howard & E Bishop 31-9. S Kirk, S Burrows, B Ewart & B Pain 15-10. Shots, Vikings 107(8) – 90(6) Saxons. Congratulations to this years Club Champions who will be representing us in the Champion of Champion comp in April also well done to the Losing finalists. Men’s Singles Ian Kenyon.- Runner up Geoff Paylor. Ladies Singles Maggie Furness – Runner up Barbara Brown. Men’s Pairs Martin Foulcer & Ian Kenyon – Runners up Neil Burrows & Gary Thorpe. Ladies Pairs Lin Watkins & Carol Thorpe – Runners up Eve Blythe & Maggie Furness. Mixed Pairs Pauline & Pat Rafferty – Runners up Lynne & Eric Bishop. 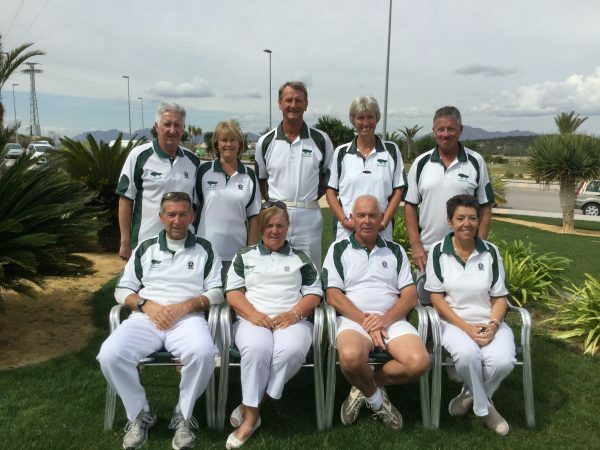 Mixed Triples Lin and Charlie Watkins & Peter Whitehall – Runners up Tony French, Gary & Carol Thorpe. Mixed Fours Jenny & Dave Chaplin and Gary & Carol Thorpe – Runners up Del Gunning, Lynne Bishop, StJohn Broadhurst & Eric Bishop. Missing from the photo are J&D Chaplin and P Whitehall. Several internal comps are yet to be completed? Sponsored by Venture Fleet, Autos Direct, TV Choice & Rivingtons Restaurant. HORADADA BOWLS BY FRED TRIGWELL. 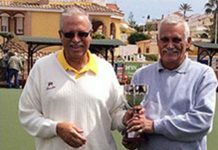 Result of Horadada’s first Valencian Champions League match against Country Bowls Herons. Horadada winning on two rinks and the Mens Singles as well as the overall shots, 125 to 95, Points Horadada 8 the Herons 6. Well Done Horadada, a good win away from home. Another good result although we lost 7-5 to Quesada who were top of the Winter League at the time. 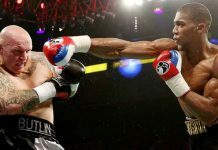 It was definitely a Hadaway day as both of them won. Shirley did by one with great help from Phil Pape, Carol Smith and Kathy Manning and Dave managed a super win with only 24 shots in 18 ends. So well done the other three……. 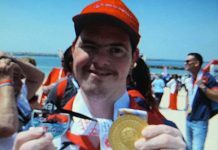 of course as you might guess, it was his three girls, Jean Perchard, Barbara Forshaw and Janet Parsons. Our other Scotsman hammered his way to a well earned draw so good bowling, John Mallet, Mike Smith, Mo Kidd and Mo Taylor. The Berleen didn’t fare too well this week. Let’s just say they lost. 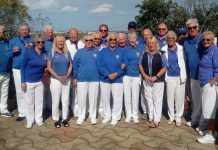 SAN LUIS BOWLS CLUB REPORT 24.03.17. Just as the spring season starts, cool weather & winter woollies are back again! Wednesday 22nd Winter League away at San Miguel a real game of two halves. For a long time it seemed we might only win 2 points from Keith Jones’ rink. However everyone (win, draw or lose) worked hard, through the last few ends, to pull back the shots for a very positive result; points 9-3, close shots 83-79. Winners: Ann Holland, Keith Phillips, Sabrina Marks, Mal Hughes 16-15, Irene Everett, Vic Slater, Neil Morrison, Peter McEneany 20-20, Lynne Morris, Jo Pering, June & Keith Jones 22-15, Shirley Verity, Ray Clarke, Jules Pering, Russell Marks 16-12. With 4 matches to go, this result has moved us into 1st place, just 1 point ahead of Quesada so we have to keep fighting right to the end! The Berleen team just missed out this week. Ladies’ Singles winner: Kath Reid, r/u: Margaret Morrison. Men’s Singles winner: Russell Marks, r/u: Julian Pering. Ladies’ Pairs winners: Kath Reid & Sheila Cammack, r/u: Ann Holland & Pam Lockett. Men’s Pairs winners: Steve Simmons & Julian Pering, r/u: Ray Pollock & Giuseppe Galelli. Mixed Pairs winners: Kath Reid & Tom Hill, r/u: Sabrina & Russell Marks. Mixed Triples winners: Sabrina Marks, Keith Jones & Russell Marks, r/u: Lynne Morris, Roy Cordell & Tom Hill. Mixed Rinks winners: Steve Simmons, Sabrina Marks, Keith Jones & Russell Marks, r/u: Ros Holmes, Christine Brooks, Dave Blackie & Scott Malden. Drawn 2 Wood Pairs winners: Ros Holmes & Phil Hasler, r/u: Dave Blackie & Peter Fuller. 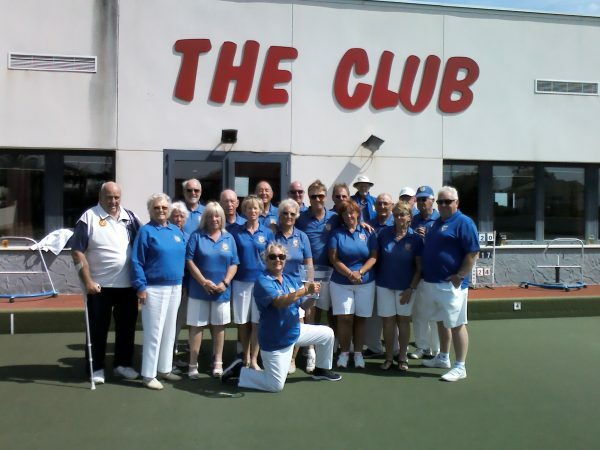 On Thursday 23rd we had the great pleasure of hosting the Bowls England Tour, English President’s Team. There was much hilarity & some good bowling, San Luis won 4 games -3, but friendship won overall. Friday 24th VCL, SL Falcons were home v La Marina. A good start to the season 10 points-4, 140 shots-70. Winners: Pairs – Jan & Brian Pocock 26-10, Trips – Margaret & Neil Morrison, Derrick Cooper 24-9, Rinks – Pam Lockett, Les Bedford, June & Keith Jones 21-13, Rinks- Ann Holland, Vic Slater, Sabrina & Russ Marks 36-4. 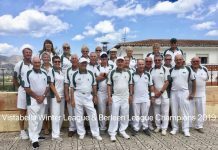 The Winter League picked up 3 points against San Luis this week, with Alan Patterson, Brian Miller, Brian Allen, Lin Miller winning 17-9 and Carol Rudge, Reg Cooper, Don Whitney, Ian Rogers drawing 20 all. Hard lines to Cliff, Val, Chris and Stuart who got beat by 1 point. Shots were close, 79 to 83. The Berleen won 18-13, Margaret Rogers, Jan Allen, Mick Rogers, Lee Sinclair, well done. Dont forget the AGM, Thursday 6th April 0930 for 1000 start prompt. THE GREEN WILL BE CLOSED FOR BOWLING UNTIL THE MEETING ENDS. Date for the diary – PRESENTATION EVENING will be held on Tuesday 25th April at El Prado, see notice board or Janet Thomas for further details. Club Mornings still going strong, Tuesdays, Thursdays and Sundays 0945 for 1015. 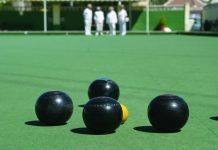 WASPS on Wednesday afternoons, 1.30, Come along and have a go at bowling, only 5euros for an afternoons bowling, with use of woods and shoes. Free tuition if required. For further information on San Miguel Bowls Club, please contact the President, Eileen Potts on Telephone 966730376 or Secretary Pat McEwan, telephone 966714257. Singles finals were John Ball who defeated Brian Fraser 21-11 and Irene Mangan who defeated Sue Jordan 21-15 in match where the lead switched after 15 of the 21 ends played. Earlier in the Mixed Singles it was Sue who defeated Irene by 21-7. The Mens Pairs was won by Harold Charleton and John Taylor who beat Ramsey Sinclair and Alex Morrice 19-9 whilst in the Ladies Pairs Dawn Taylor and Val Dalton triumphed over Penny Porter and Hilary Clarke 26-9.In the Mixed Pairs Dave Davies and Irene Mangan came up trumps by 19-15 beating Sheila Chorley and John Ball. The winners of the Mixed Triples were Pat Harman, Rab Logan and Norman Adcroft who defeated Joy and Brian Gardiner with Jean Cooper 25-11. Finally, the Mixed Rinks saw John and Dawn Taylor with Harold Charleton and Val Dalton beating Joy and Brian Gardiner with Pat Reilly and Jean Cooper 21-15. Thanks go to the Umpires Brian Gardiner and Jean Cooper and the Markers Pat Reilly, Pat Harman and Brian Gardiner for their sterling work and also to the loyal club members and friends who turned up to support the finalists and to watch some excellent bowling in superb weather conditions. 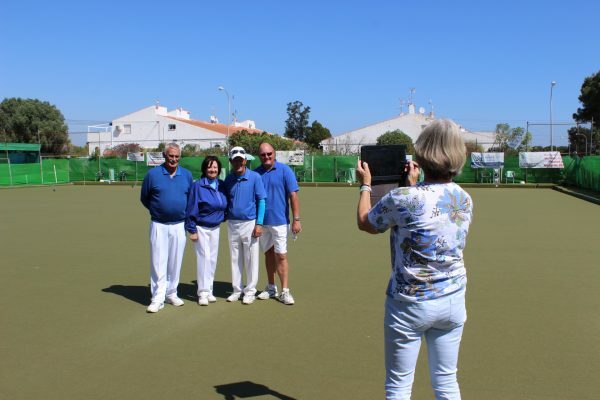 In the Winter League La Siesta played away at Greenlands and won on 2 of the 5 rinks whilst the rink of Ann Edgerton, Mike Edwards and Trish and Pat Reilly took their match to the final end before succumbing to their opponents. 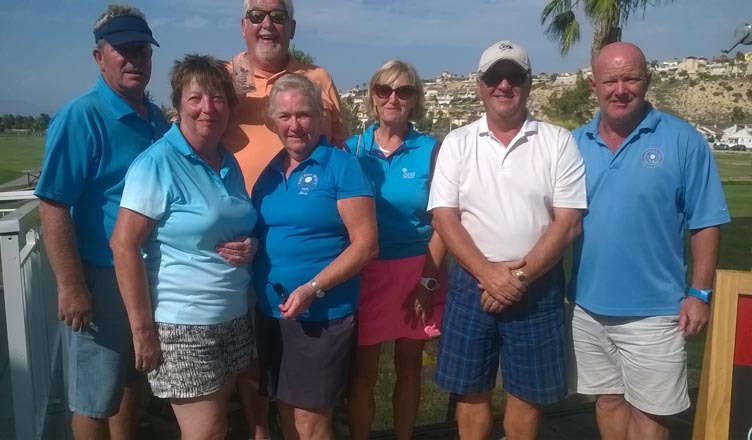 The winning rinks for La Siesta were provided by Sheila Reilly, Pat Moore and Bill and Sue Jordan who won 23-13 and Jo Elkin, Rod Edgerton, Jim Hudson and Brian Fraser who won 21-13.The overall shots were 81 to La Siesta and 96 to Greenlands.